Over the last decade, more and more states have chosen to legalize the sale of both medicinal and recreational marijuana. Even without national legalization, the U.S. marijuana market was worth $9.2 billion in 2017 and is projected to reach $47.3 billion by 2027, a growth rate of 514% over 10 years (source: Arcview Market Research and BDS Analytics). Investors are flocking to the marijuana industry, seeing it as one of the safest long-term bets in recent history. Many of them are directing their investments toward dispensaries rather than growers, according to Scott Greiper, president of Viridian Capital Partners. As the number and size of dispensaries grow, so do consumer expectations of the quality of marijuana products and the availability of diverse and unique brands. As in the wine industry, premier brand names can command a price ten or more times that of an average product. On behalf of their customers, dispensaries are looking for consistent quality and a range of products. So while the opportunity to run a lucrative and stable growing business has increased dramatically, there is more and more pressure for growers to produce a consistently high-quality product in order to turn increased demand into increased dollars. What are the most important points of growing a consistent crop to build your brand? Again, borrowing from the winemaker’s metaphor, it’s all about what you’re growing, where you’re growing it and the conditions it’s grown under. 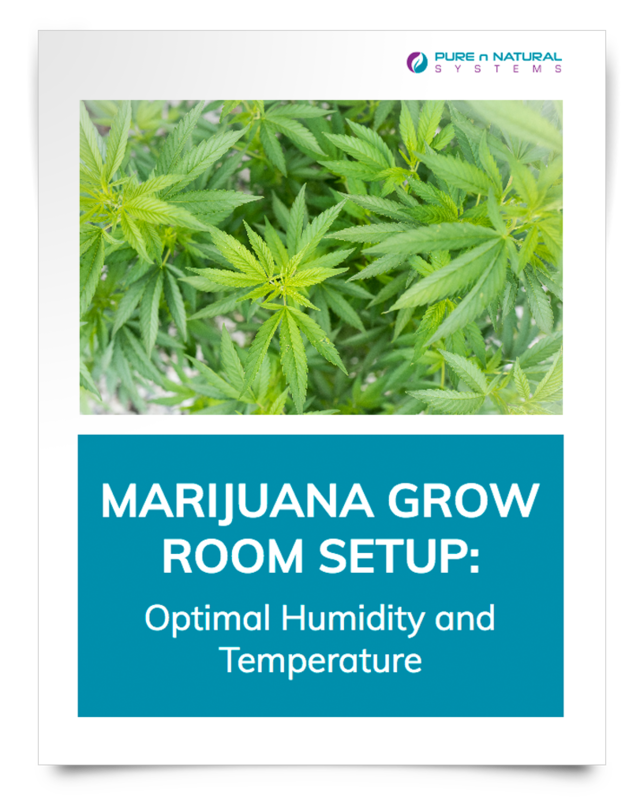 Below, we’ll look at how to create the best growing environment, with a focus on humidity and temperature controls. To start with, relative humidity is determined by how much water vapor the air can hold at a specific temperature. Warm air can hold more water than cold air, so the warmer the air is, the higher the relative humidity will be. As you probably already know, after choosing a substrate (the material you’ll be growing your plants in/on), the strain(s) of cannabis you’ll be growing, lights, watering mechanisms and nutrients needed, the most important element of your day-to-day operation will be managing temperature and humidity. Each stage of a plant’s life-cycle is prone to different needs. With the right equipment, these needs are easily managed when the focus is on keeping everything within the desired ranges and as constant as possible. To get started, you’ll want to buy a hygrometer and a thermometer. With these tools, you can accurately monitor and then alter humidity and temperature conditions in an attempt to strive for repeatable quality levels time and time again. The increased humidity levels allow seedlings to take water in through the leaves while their root systems are developing. Temperatures may be increased slightly if desired. As the roots are now more developed, they’re able to perform most of the needed water uptake with evaporation through the leaves now cooling the plants. IMPORTANT– Never above 60% humidity! Depending on your lighting solution, season a specific crop is grown in (assuming year-around production), the outdoor air vented in (as it will vary in temperature and its own relative humidity), controlling temperature and humidity in your growing space will be one of the tougher challenges you will face on a day-to-day basis. While it’s tough, just know that every grower working at a scale similar to you is going through this as well. Run your existing tube vent on higher velocities or upgrade your air flow fans. This applies to both air exits in tents and the room it is placed in! Increase fresh/cool air supply. Try to water your plants right after lights are switched on. The room will be cooler at that time and the immediate absorption will result in less overall humidity. The most consistent option will be: Invest in a decent sized dehumidifier–small humidifiers don’t have large enough tanks to keep up with the demand. Though it may be exciting to see the fruits of your labor as you begin harvesting, the work is far from done. Correctly processing your crop helps prevent any chances of it becoming damaged or rendered non-smokeable. Proper drying and curing are essential to minimizing the risk of mold contamination and it also greatly improves the taste when smoked. On top of the need for specific temperature and humidity controls throughout the growing process, it’s worth mentioning that humidity level during the drying process is equally important to the quality of the final product. Too much humidity in your curing space and you might be left with perfectly grown, but moldy cannabis. Nobody wants that; neither the individual user nor the dispensary buyer. Moldy cannabis is easily the fastest way to ruin your reputation as a reliable grower of high-quality buds. The curing process breaks down chlorophyll remaining in the plant, resulting in a less-harsh taste. Remember: harsh buds are not quality buds. These procedures can enhance the shelf-life of a crop, which is highly important with a product like cannabis that isn’t afforded the addition of preservatives. “Wet trimming” involves trimming as soon as plants are ripe. Remove individual branches and proceed to use sharp scissors or shears to precisely trim excess plant matter. As soon as the plants are cut down, the drying process begins. What’s immediately noticeable is how sticky and wet the buds are. While this is an excellent indicator of potential quality, it’s also a breeding ground for contaminants. Buds left in this state will almost certainly be ruined so it is best to act quickly to begin a controlled drying process. Widely regarded as the preferred method, “wet trimming” offers the most control and quality assurance. It also has the added benefit of allowing you to collect the “sugar leaves” which contain lower cannabinoid levels and can be stored separately to be processed into edibles at a later time. Remember that “High THC; low Cannabinoid level oil” states list from before? This is where that product comes from. This technique is usually reserved for growers with a large amount of plant matter and little time to process it. This involves cutting off branches and hanging them whole from drying lines. Once the plants are dry, they are then trimmed and processed. It is more difficult to achieve the neatness of a wet trim as sugar leaves will curl in toward the buds while drying. The agitation of handling a dried bud during trimming can also result in the loss of potent resin crystals. Whichever method you choose for trimming your product, suitable conditions for your drying room are important. You’ll want a cool, dark environment with temperatures in the range of 59-71°F and humidity at or near 50%. Yes, even after the growing process is completed, you still need to be concerned with temperature and humidity. If you opt to use the wet trimming method, you will need to spread them out across a large surface area. Aeration is important so you’ll want to avoid setting the flowers on a surface like cardboard or newspaper as the buds will dry unevenly. Wire mesh or netted drying racks are more beneficial. This allows airflow to reach all sides and lessen the chance of moist air pockets. Make sure to allow yourself enough space to spread your crop out evenly with a small amount of space between buds for the best results. You may be tempted to speed up the drying process but it has been shown that slow and steady wins the race. Rushing the process and exposing your crop to high temperatures will almost certainly reduce the quality, and result in diminished flavor and even potentially a “poor and uncomfortable high.” Good luck explaining that to your investors or to a discerning dispensary that has numerous growers vying for their shelf space. Check on your crop frequently, approximately every three to seven days. They will become noticeably drier with each check. You’ll know your buds are properly cured once they can snap easily in your hands without any signs of stringiness. Any bendiness when twisting slightly will tell you there’s water still present and that they’re not ready to move to jars yet. Pure n Natural Systems specializes in the sale of commercial and industrial humidifiers, dehumidifiers, drying fans, air movers, and portable heating and cooling solutions. We have the equipment you need to make your growing operation a consistent success. And as we’ve already discussed, consistency is king. That said, we are not experts in growing specifics or in the design of custom-growing spaces. However, if you say you need to remove 50-gallons of water a day from the air in a warehouse setting, we can help!